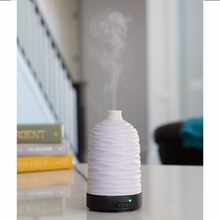 The Harmony Diffuser has a modern feel with gentle waves covering the ivory matte ceramic sleeve. Use with our luxurious Essential Oil Fragrances and create mist and fragrance to help enhance health and mood. Two mist modes, 7 LED colors, an Auto Shut-off feature, and 100 ml capacity make it easy to create a soothing environment.